SOLVE (Stop Oregon Litter and Vandalism Everyone) is a state-wide non-profit organization that takes action every day to keep Oregon clean and green. They mobilize volunteers and organize cleanup and restoration projects throughout the state. SOLVE also strives to protect our State’s natural resources. The Oregon Parks and Recreation Department was recognized this year at the Tom McCall Leadership Award banquet. 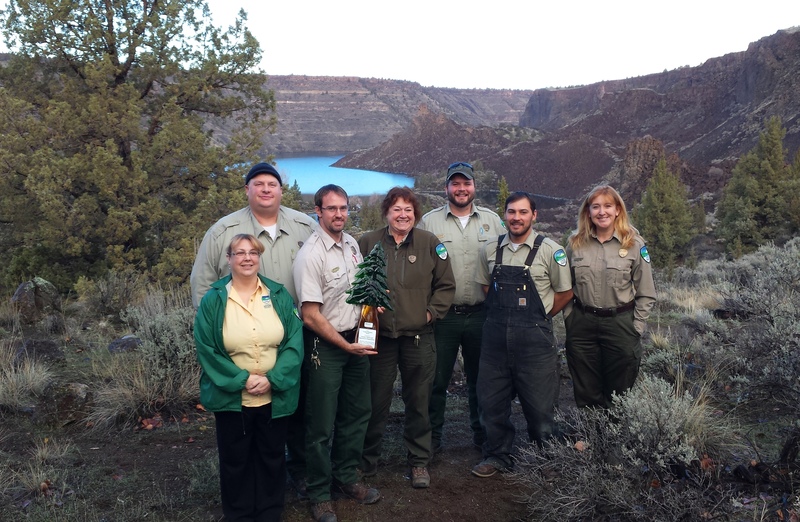 Our agency won the Oregon Champion Award for our work hosting volunteer events to protect and preserve Oregon’s State Parks, historic landmarks and waysides. The Cove Palisades State Park was chosen to represent the Eastern Region. The Cove staff could not have achieved this award without hundreds of outstanding volunteers – through the Lake Billy Chinook Clean Up Days, Eagle Watch, the STEM (Science, Technology, Engineering and Mathematics) Program, Seeds For Change, Park Hosts, Recycling Volunteers, Service Clubs, individuals and more! We would like to take this opportunity to thank all the volunteers that have worked hard at The Cove Palisades State Park over the years to make this the beautiful place we all know and love.